1. Concealing aggressive behaviour and intention. 2. Understanding the psychological shortcomings of a victim in order to determine which method will achieve the best results. 3. An uncommon degree of ruthlessness, having no reservations about inflicting harm upon their unsuspecting victim. Who do they target? Anyone can be a target of an emotional manipulator. • Empathetic, kind and easy-going people who try to avoid conflict. These kind and considerate people are likely to forgive the narcissist time and time again for their monstrous behaviour. • The independent, accomplished person will be a great source of narcissistic supply once they have fallen under their spell. The narcissist has mastered the art of deception. Although their intentions may initially appear to be honest and sincere, their ultimate goal is to deceive, exploit and manipulate. Whatever the relationship with the manipulator, be it parent, spouse, partner, sibling, child, friend or co-worker, this relationship is unbalanced from the beginning. Their aim is to, by any devious means necessary, gain control of your mind, resulting in you becoming an unwilling participant in their schemes. How can any such connection not be doomed from the outset? Narcissists are known to be very observant at the start of any relationship. They listen intently as you reveal details of your past, your feelings and vulnerabilities, to use this information against you for their own gain. Narcissists are adept at distorting the truth. 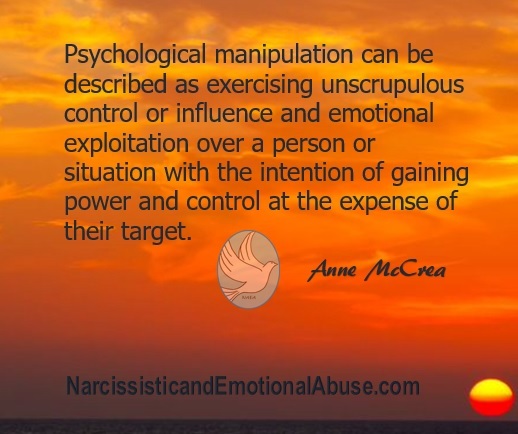 Manipulators are often compulsive and pathological liars. They will twist events, things you’ve said or done, turn them around, and maybe add a few lies so that their version becomes a far cry from reality. Of course, their target is left feeling confused and full of self-doubt. Manipulative people will often play the victim to circumstances they have created. They lack accountability for their words or actions and twist the situation round to blame you. A common form of manipulation is that of turning people against each other, creating jealousy and disharmony. They talk behind backs spreading false information so that people become distrustful of one another. Splitting, as this is sometimes called, puts the narcissist in a position of power. Passive aggressive behaviour is common. They go between being pleasant one minute to refusing communication the next (the silent treatment). Their target is left reeling, wondering what they have done wrong when in fact, the answer is, absolutely nothing at all. Explosive rages and personal attacks and criticism are another favourite tactic. They are relentless in their pursuit of grinding you down until they get what they want. Your emotional health and well-being are of little importance. Targets of such insidious manipulation unintentionally give up a part of themselves to keep the peace and please someone who is simply impossible to please. Unfortunately, once these twisted individuals succeed in taking advantage of your kind and forgiving nature, they are likely to repeat this behaviour over and over again until you put a stop to it once and for all. We all have the right to be treated with respect and set boundaries as to what is acceptable behaviour and what is not. Learn to be assertive. You have the right to your own opinions and values and the right to express these without being put down by someone whose moral values are sub-standard to say the least. Never be afraid to say, ‘No’, and don’t feel guilty for doing so. Remember that someone who feels the need to manipulate others has failed to mature emotionally. Although they may appear to be strong and in control, there are often underlying insecurities and self-doubt. What you see is not what you get. Their dysfunctional behaviour is likely to tumble over from one relationship to the next. They absolve themselves from any responsibility in their continual failed relationships. Narcissists’ failure to hold themselves accountable for their behaviour is in complete contrast to them holding you accountable for yours. • Do you feel you are constantly walking on egg shells around this person? • Do you feel as good about yourself as you once did? • Do you feel taken for granted? • Do you feel that whatever you do, it’s never enough? • Is it always you who is doing the giving and them the taking? • Are you losing friends, acquaintances without knowing why? • Are you subjected to their passive aggressive behaviour? • Does this person try to tell you how you should think or feel? • Do you feel that it is all about their needs whilst yours don’t matter? • Do you feel pressured into doing things that you are not happy with? If you have answered ‘Yes’ to some of these questions, it may be time to re-evaluate what part, if any, you want this person to play in your life. So true! If only I would of read this 40 years ago when I was a teenager! Life could have been tremendously less stressful! Oh gosh. Still trying to break free. Broke up over 2 years ago. He’s still manipulating me to take him back. Says he’s got nothing and no one. Gonna kill himself, post intimate pictures of me on social media. Guess what’s the only thing that will stop him from doing either? Him getting his life back with me. I know no contact is the answer but he seems to just creep back in somehow. Trying to be strong at the moment. He told me he hopes I have a breakdown and he will never leave me alone. They never give up, and it has nothing to do with you. Why do you keep hearing what he’s saying to you?